I love being able to work in fashion, I can look cool at interviews and have them say they like my style :) Yes that happened today. I got good news, they said they really liked me and I have to go back for a second interview. The bad news is that the second interview is in 2 weeks -____-IDK what to do. I want to wait it out because I really like that company and I think it would be a great opportunity, but also I don't want to get rejected and have to scramble to look for another position. BUT IN OTHER HAPPIER NEWS, I FINALLY TRIED MACAROONS! This photo above chronicles the lemon goodness that is my first bite of lemon macaroon amazingness. I also bought red velvet and salted caramel. OMG SALTED CARAMEL IS MY SECOND FAVE! Red velvet was bland. But I love the texture of these, my only negative is that fact that these little petite sweets are freaking $1.75 each! Thats pretty much as cheap as they come in this region, too bad I'm obsessed. ahahaha. Why did I buy that same top, but later returned it -___-? Anywho, what job, I want to know? And you tried your poison treats, yae!!!!! lol. ITS NOT POISON! AND lol did I buy the top you returned? Probably. I love that big bow on the dotted Swiss Daniel Rainn blouse and the pretty lace under the hem of the skirt. Good luck with your 2nd interview or whatever else you do, and happy macaroon munching! YESS that's why I bought it! It was so cute and I have a similar top already in white. And thank you, I hope I get it, it seems so perfect. 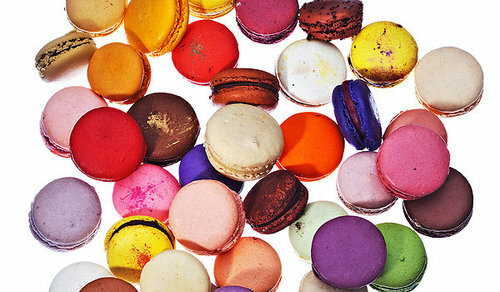 You must try these macaroons, they are amazing!